Iceland is a world with its natural beauty, but a miracle of Mother Earth is above all the magical waterfall Gullfoss. Icelanders themselves believe this landmark as one of its largest and is not accidentally called the Golden Waterfall. This amazing natural picture of the falling crystal waters is a spectacular natural phenomenon not only for Iceland itself but also worldwide. Gullfoss is one of the most powerful waterfalls in Europe with its double cascade of 105 feet. Along Gullfoss you often see a picture that includes the strong water flow against the backdrop of dozens of arches that are formed as a result of broken sunlight. According to one study, waterfall Gullfoss was named the most fascinating sight in Iceland. It not only impresses with its beauty, but also with its spectacular size. The height of Gullfoss reaches a significant 32 meters and width of the falling water is about 20 meters. Gullfoss is called the Golden Waterfall because of the beautiful picture that takes place there at sunset , the color of the water is like gold because of the falling sun. It is best to see Gullfoss during the sunny days when the small clouds that surround the powerful water flow move alongside the colorful arcs. The result is a unique picture from a wide range of iridescent colors. 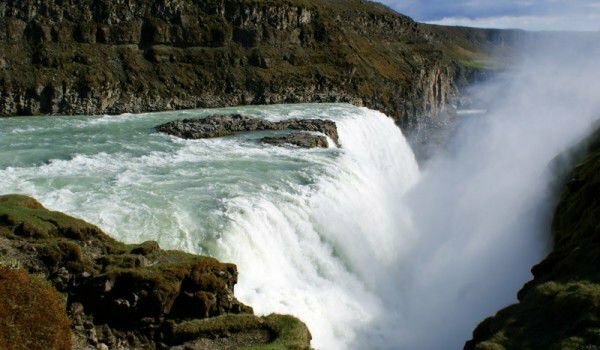 There is a myth that people still tell till today of a young woman who threatened to throw herself from the waterfall managed to save the natural beauty and richness of Gullfoss. Today the waterfall falls under the same name of the national park, which enjoys a high interest from tourists. Waterfall Gullfoss is part of the river, known as the White River which accounted for the powerful waters of Gullfoss and is about two kilometers wide and half a depth of up to 70 m.
The view of the waterfall Gullfoss is particularly fascinating in winter months when everything is wrapped in snow and ice. It is believed that the Icelandic landmark was formed at the end of the last glacial period when there were torrential floods from the glacial outbursts. Indeed Gullfoss is composed of two separate waterfalls. From the upper water falls there is a height of 21 m and from the lower part of the water masses there is a flow from 11 meters. Water flows through Gullfoss at an average rate of 109 cubic meters per second. The strongest flow recorded is 2, 000 cubic meters per second. During the summer months the water flow is up to 130 cubic meters per second, which means that it can fill the building of the nearby tourist museum for about 3 seconds. In the museum the visitors of the waterfall Gullfoss have the opportunity to learn about its history.